Both social structures and people’s beliefs affect the diffusion of innovations, but few studies have been able to understand how these dual influences operate simultaneously. Understanding this simultaneity is important because sustainable practices are influenced by the processes of social learning which build on individual interactions to become embedded in communities of practice. 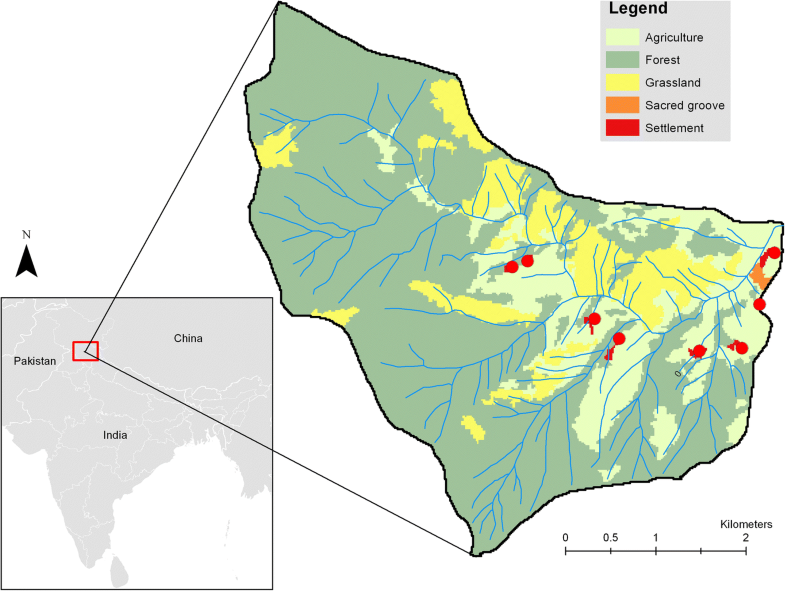 We combined social network and cultural consensus analyses to understand the diffusion of information on “cleaner” cookstoves in eight villages located within a micro-watershed of Kullu District in Himachal Pradesh, India. First, using social network analysis, we identified networks of information flow for three “cleaner” cookstoves: liquefied petroleum gas (LPG) cookstoves, induction cookstoves, and Himanshu tandoors. Second, we identified key players in the cookstove information networks. Third, using cultural consensus method, we determined and compared the beliefs of the key and non-key players, as identified from the information networks. We found that information networks for selected cookstoves varied in structural measures of density and centrality. We also found that a local non-profit played a lead role in spreading information about selected “cleaner” cookstoves. There was a consensus among both key and non-key player groups regarding beliefs about selected cookstoves; however, non-key players had a higher agreement among themselves and fewer overlapping beliefs than key players. We also found that key players were not always users of the technology itself. This implies that key players, unlike opinion leaders, were not necessarily proponents of selected cookstoves but were able to spread information about them because of their position within the networks. We identified the mismatches in beliefs regarding “cleaner” cookstoves within a community. These mismatches reveal the differences in what people know and what they share through interactions within social networks, suggesting that communities of practice have yet to form. Because the formation of communities of practice has implications for how the adoption of sustainable technologies becomes routinized, we stress the need for more socio-cultural perspectives in diffusion studies. Roughly 40% of the world’s human population relies on biofuels such as wood, charcoal, crop residues, and animal dung for cooking. Burning these fuels contributes to individual health and environmental concerns. Every year, nearly 3.8 million people succumb due to the use of inefficient and unsafe cooking technologies , and the use of these cooking technologies also contributes to climate change through greenhouse gas and black carbon emissions . “Cleaner” cookstoves have the potential to address these concerns. The United Nations has proposed seven sustainable development goals pertaining to energy alone, and the goal is to achieve universal access to “modern” energy by 2030 under their Sustainable Energy For All Initiative . Researchers and policy-makers believe that diffusion of “cleaner” cookstoves can help in achieving sustainable development goals of good health and well-being, gender equality, affordable clean energy, climate action, and life on land . Despite the attention from governments, researchers, non-governmental, and non-profit organizations aimed at promoting “cleaner” cookstoves, adoption and sustained use of “cleaner” cookstoves have met with limited success [5–8]. In India, three decades of various cookstove diffusion programs have failed to achieve widespread adoption of “cleaner” cookstoves. The limited impact of these programs was attributed to their lack of consideration of the local context [9, 10]. Cookstoves are integrated into the local social system through years of social and environmental learning. Many programs aiming to diffuse “cleaner” cookstoves ignore these processes and their associated norms by focusing only on dissemination and design [6, 10, 11]. We use the term “cleaner” within quotes to highlight the subjectivity associated with of how cleanliness is perceived depending on who one talks to, the normative viewpoint on what is clean, and the descriptive viewpoint of how people perceive cleanliness. Research looking into reasons for the failure of widespread and sustained adoption typically considers cookstove designs, financial and market mechanisms, socio-economic and demographic characteristics of households, and suitability to social and environmental needs [12, 13]. Though the technical aspects of innovation are important, Rogers  argues that people often overlook these technical and objective aspects as they rely more on subjective evaluations that they hear from other people. Just understanding the material availability and technological efficiency does not do justice to the household energy systems and elides broader discussions of energy as both instrumental and constitutive of culture, society, and sociality. A few studies have sought to understand how social networks influence the diffusion of cookstove technologies [15–17]. These studies have looked at the structure and composition of networks to understand peer effects, the role of opinion leaders, and the spread of information on “cleaner” cookstoves. However, network measures rely on an actor’s position in the network, often leaving aside any discussion of their beliefs and views or extent of shared beliefs with members of their community. We address this critical gap in cookstove diffusion studies by combining social networks and cultural consensus to provide a more nuanced understanding of social-cultural processes that influence cookstove information diffusion. We focus on the networks of information flow and the consensus about beliefs that frame people’s subjective evaluations of cookstoves. We believe that studies encapsulating both structural and cultural factors provide a fuller description of social processes that aid in the diffusion of new technologies [18–20]. In this study, we situate the subjective meaning ascribed to cookstoves within the objective social structures by integrating social network and cultural consensus analyses. We hope that this integrated approach will inform programs that facilitate and promote the adoption of “cleaner” cookstoves, and therefore, address concerns of individual and environmental health, well-being, and climate change. Recently, many studies have called for more attention to social practices in the context of sustainable transitions [21, 22], and particularly sustainable energy transitions , as a way to attend to their multi-scalar processes and place-specific contexts. Energy researchers have identified “communities of practice” as arenas in which the relationship between actors and energy undergoes constant transformation . The practices that define these communities are socially learned by actors embedded in larger social networks. Reed et al. defined social learning as “a change in understanding that goes beyond the individual to become situated within wider social units or communities of practice through social interactions between actors within social networks.” Understanding how actors learn, change, and diffuse practices through social networks is an important step in understanding the multi-scalar, yet place-specific, factors influencing sustainable energy transitions. This attention to social practice shifts the focus of analysis from assumptions of individual cost-benefit decision-making, which remain dominant in many formal economic models of sustainable transitions [26–28], to the ways in which routinized embodied actions and understandings relate to larger social contexts and processes . Understanding the relationships between and within communities of practice, defined by the production, transformation, and exchange of certain routines, is of utmost importance to the studies of sustainable energy transitions, as these are the sites in which sustainable energy practices develop . In order to better understand the relationships between communities of practice, we focus on the structure of social networks and the cultural beliefs of people embedded within those networks. To do so, we rely on two broad theories and methods—social networks and cultural consensus. In the following two sections, we provide a brief description of them and situate them within the context of diffusion of cookstove information through social learning processes. Good technological design alone has not ensured widespread adoption of a technology, and therefore, a number of theorists have used social networks to explain such adoption in different ways. We draw from the Diffusion of Innovations theory  for this study. The innovation here refers to “cleaner” cookstoves that have been a fairly new addition to the people in the study area. Diffusion is “the process in which an innovation is communicated through certain channels over time among members of a social system” . Deroïan  argues that “a social network, conceived as influence relationships, has to convey a sufficient level of influence for the innovation to spread.” Therefore, understanding the key attributes of the communication network through the lens of existing social ties could reveal pertinent aspects of the diffusion process. Another important attribute of communication networks that social network analysts examine is how key individuals influence communication via their position in the network. Key players and opinion leaders, as identified by the structural properties of a network, can play an important role in technology diffusion. Whereas opinion leaders are proponents of a technology, who can communicate widely and encourage adoption of a certain technology via their position in the network [31–33], we refer to key players as those individuals who are identified as potential diffusers of a technology based on the network structures only. Humans acquire most of their behavioral traits through social learning or cultural transmission . Individuals that belong to the same social group generally behave in similar ways, hold similar values, and share a common belief system, which is imparted to individuals within that group through social learning processes . This shared belief system that comprises culture can be analyzed in several ways. We use cultural consensus method to identify shared beliefs regarding cookstoves . The central idea of the cultural consensus method is to use patterns of agreement among individuals to make inferences about their differential knowledge of the shared information pool constituting culture. Borgatti  provides empirical proof of consensus analysis, which models shared knowledge within a community and then tests individuals’ consonance against that model to understand similarities and differences. The agreement among people is taken as a function of knowledge and the degree to which each informant’s responses match that model is their level of consonance. A high degree of correspondence between each informant’s set of responses and the hypothesized cultural model provides a measure of consensus, thereby enabling an understanding of the rationale behind practices that could be prototypical of a given cultural domain. We believe that comparing the degrees of consonance of people in key and non-key player network positions will help to illuminate processes that drive household decision making toward energy transitions, which in turn will inform programs that aim to achieve the United Nations’ Sustainable Development Goals of providing universal access to modern energy for cooking and electricity by 2030 . Learning from individuals within the community through processes of social learning is important because an individual may not have complete information about the technology. Some individuals are better “information givers,” and their position in the information network facilitates their role as key players and opinion leaders. But a social network is composed of both structural and cultural components. To amalgamate the two, we combine social network analysis with cultural consensus to address the following objectives: (a) to identify and compare networks of information flow for three “cleaner” cookstoves (liquefied petroleum gas (LPG) cookstoves, induction cookstoves, and Himanshu tandoors); (b) to identify key players who occupy strategic positions to facilitate diffusion of information in the cookstove information networks; and (c) to compare how key players’ cultural beliefs regarding cookstoves differ from those they communicate with. We hope that our study will help overcome some of the pro-innovation biases that most diffusion studies tend to harbor , by coupling cultural perspective with network characteristics. In India, 80% of the rural population, or 134 million households, rely on wood as the primary source of fuel . Additionally, recent estimates suggest that annual mortality because of household air pollution due to the burning of biomass for cooking and heating across India is around 924,550 . The reliance on wood and use of “traditional” cookstoves is more prevalent in the Himalayan region, where people not only use fuelwood for cooking, but for water and space heating as well. We conducted our study in a watershed within Lug Valley in Kullu district, Himachal Pradesh (Fig. 1). Lug Valley is characterized by a mild summer and severe winter. People generally depend on wood, agricultural and forest by-products, kerosene, and LPG for cooking, heating, and lighting needs. The harsh winters increase people’s dependency on wood for heating, especially given the intermittent power supply and limited accessibility to the villages, except by foot. A local non-profit has introduced “cleaner” cookstoves to people in Lug Valley. Because of its targeted approach, nearly all households know about the new cookstoves, and many have adopted them. There are eight villages within the study area. The villages lie on gentle slopes of the same side of a river and are accessible to a certain extent by road, or up to an hour’s climb by foot at the most. All the villages are also connected by foot through forest areas toward the top of the mountains. The villages are very similar to one another in layout, and people mostly practice agriculture, along with livestock rearing and weaving. Most of the houses are constructed out of wood and stones, and people have access to electricity and water for most of the year, except in winter months when snowfall and precipitation can damage infrastructure. We covered all eight villages for our study that comprise the watershed and found that the total human population was 1509, distributed in 295 households. While approximately 60% of the households in the study area have adopted an LPG cookstove, 95% of the households continue to use a wood stove as well. This continued reliance on wood stove and advent of LPG cookstoves through NGO-driven programs make Lug Valley an appropriate site to conduct research on cookstove adoption. Moreover, the authors have worked in the study area since 2012, which enhanced the data collection process, especially for social networks. The cookstoves that are most commonly used in this region are mud cookstoves (chulha), tandoors, Himanshu tandoors, LPG cookstoves, and, more recently, induction cookstoves  (Additional file 1). For this study, we focused only on the cookstoves that are considered “cleaner”—Himanshu tandoors, LPG cookstoves, and induction cookstoves. Himanshu tandoors are wood cookstoves with a chimney. They are a modification of the tandoors that have existed for over 50 years in the study area. These “cleaner” tandoors have grates for soot removal and retain heat for longer due to fire-bricks that line the inside. These cookstoves also allow for cooking of multiple items simultaneously. LPG cookstoves are gas cookstoves with a cylinder of fuel that is connected by a pipe. Induction cookstoves are electric cookstoves that in the study area are small portable units with a single heating surface. To address the objectives of our study, we combined social network analysis with cultural consensus analysis. Using social network analysis, we identified key players in our network. Using cultural consensus analysis, we elicited their beliefs regarding “cleaner” cookstoves and compared them to non-key players’ beliefs regarding the cookstoves. We collected data for this study through participatory mapping, group discussions, and surveys of all households located in the study area. We chose to do a whole network study, i.e., interview all households in the study area, to avoid misrepresenting the network characteristics . Our prior work in the same study area and long periods of engagement with the people (starting from 2012) allowed us to examine complete networks of each cookstove. The entire data collection process lasted from June 2016 to December 2016. We started the process with group discussions and participatory mapping exercise in each of the eight villages. Group discussions allowed us to structure our questionnaires and identify an easy way to get responses to social network questions, which can be time-consuming for both the informants and the researcher. Each discussion group comprised of six to ten people for each of the eight villages. We also drew village maps that represented all households, agricultural fields, forest areas, the location of landmarks such as water tanks, village temple, schools, and shops. The map proved to be extremely useful as a visual aid during interviews to get an exhaustive list of ties in cookstove information sharing networks. The maps allowed us to identify households correctly, which can be challenging with multiple people with similar names, and to minimize recall error. They also helped to keep the informant engaged and save time because the informant could just tick the households with whom s/he had exchanged information with. After the eight participatory mapping exercises and group discussions, we collected data for information networks of all households in the study area. We conducted a census of 295 households and collected information on household socio-economic characteristics, the flow of information on cookstoves (Additional file 2), and cultural beliefs of people regarding the cookstoves. The questionnaire covered networks for three selected cookstoves. We asked informants to list all the people with whom they had shared cookstove information and those who had shared information with them. We asked them about the year of cookstove adoption, and whether people they had shared information with had bought the cookstoves they spoke about. We also asked informants to list characteristics of cookstoves they like and dislike and to rank each of the characteristics they mentioned. We generated a ranked item list for each cookstove mentioned by the informant. Social network analysis cannot proceed without assuming the importance of relationships , and the interdependency of actors and actions. 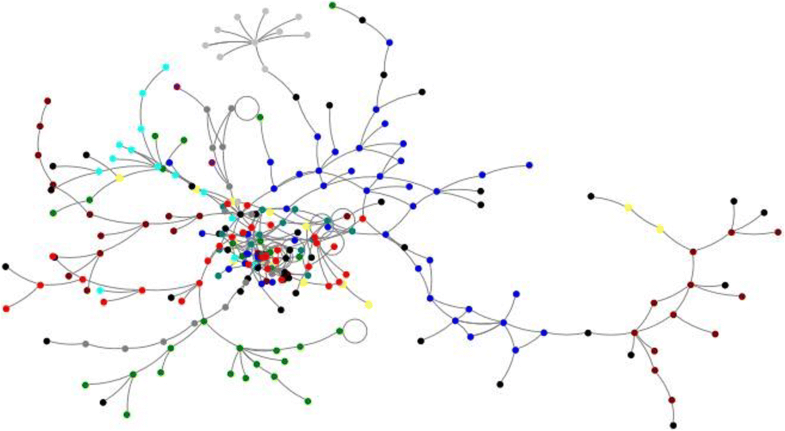 The centrality of actors was one of the early focus areas of social networks analysts, and we used this to identify central actors in our networks of villages . Following Borgatti’s outline of appropriate centrality measures for different kinds of network flows , we understand our network flow as a parallel replication walk, and for this, we used degree, closeness , and eigenvector centrality  to identify our key actors. Degree is referred to the number of direct ties an actor has with other actors in the same network. A higher degree implies that an actor is active in the network. Closeness is defined as the minimum number of ties an actor uses to reach every other actor in the same network. A low closeness score implies a better position for an actor to receive information early on . Eigenvector centrality is defined as the number of those actors an actor is connected to, who are connected to others. A high eigenvector centrality implies that the node is connected to other nodes that are more central in the network. We also calculated the network centrality measures of betweenness (number of nodes that lie on ties between other nodes) and identified the number of connected components and average geodesic distance (the average of all shortest paths between nodes in the network). Borgatti  also suggests the use of key player problem positive and key player problem negative measures to identify key players. These two measures rely on the property of network cohesion and how the presence or absence of certain nodes can strengthen or fragment the network. For diffusion networks such as ours, we considered key player program positive that gave us a set of actors that were maximally connected to the network. We used the diffuse function in key player program positive that helped identify households that send information maximally to other nodes. The diffuse function considers degree centrality measures, reciprocal closeness centrality, and the number of nodes within the shortest path (From Keyplayer 2.0 documentation 2006). We used Ucinet  and Keyplayer software  for our data analysis. To visualize the networks for each cookstove, we used Harel-Koren fast multiscale layout  in NodeXL . For each cookstove information networks, we identified the nature of ties, described as intra-village, inter-village, ties with the local non-profit, and ties outside the study area. Cultural consensus analysis focuses on the understanding of the extent to which a group of people shares similar beliefs about a specific topic. It assumes that people think about things through cultural models or cognitive schema that are intersubjectively shared by a social group . Analysis of cultural consensus begins by estimating this cultural model through ranked lists that pertain to one topic, which represents the degree of a group’s consensus regarding that topic. The analysis then measures people’s individual beliefs against this cultural model to understand the extent to which that cultural model is shared across individuals. Those whose beliefs align with the cultural model are consonant with it. Using cultural consensus analysis, we identify shared beliefs and norms around people’s choice of cookstoves, drawing attention to how people rationalize their choice of cookstoves. Cultural consensus analysis uses factor analysis to establish whether people share a cultural model. If results from the factor analysis show that there is only one significant factor, this suggests that variability in people’s responses is not idiosyncratic and that their beliefs about a certain topic are shared [49, 50]. The significance of a factor is determined by its eigenvalue. A high ratio (> 3) of the largest factor to the second largest factor indicates that assumptions of common truth and conditional independence hold [49, 51, 52]. Additionally, the factor loadings for the one significant factor should be non-negative. This is because consensus assumes that people agree with the cultural model  and that this agreement is a function of similar knowledge about that topic . In sum, one significant factor, as determined by eigenvalues, with non-negative factor loadings indicates that there is a consensus among members of a group about a particular topic. We collected data for cultural consensus analysis using free-listing and ranking method . We asked informants to list cookstoves that they think people in Lug Valley use. After listing the cookstoves, we asked informants to list characteristics of each cookstove they identified and rank the characteristics in order of decreasing importance. Once we obtained the ranked lists, we factor analyzed the lists to check for the presence of consensus using Ucinet 6 . From this analysis, we also obtained a list of factors that were deemed important, providing us with an “answer key” and individual scores for informant’s degree of agreement with the built model . We then identified 30 key players from the whole information network for all three cookstoves combined. We used their ranked cookstove characteristics list to create a cookstove belief model using cultural consensus analysis [27, 49, 50]. We created a similar belief model of 30 randomly chosen non-key players. Finally, we compared the two models to identify overlapping beliefs and similarities in cookstove characteristics as listed by key and non-key players. We found that LPG cookstoves were first used in the study area in 1996, though two families had used it earlier than that when they lived outside the study area. LPG cookstoves are now the second most popular cookstove used in the study area. We found that of the 295 households, 176 are currently using LPG cookstoves in the study area, out of which 52% adopted them only after 2010. Induction cookstoves made their way into the study area through door-to-door salesmen, and the first one was adopted in 1996. These numbers are encouraging for programs aiming to diffuse “cleaner” cookstoves. Despite being the earliest “cleaner” cookstove, LPG cookstoves are only now gaining popularity because of recent schemes introduced by the Government of India . The number of ties for each of the cookstoves varied greatly, despite most households using two or more cookstoves concurrently (Table 1). LPG cookstoves were most popularly discussed, followed by induction cookstoves and Himanshu tandoors. Information on Himanshu tandoors was only disseminated from the members of a local non-profit. The network of LPG cookstoves was largest, as most surveyed individuals exchanged information about them (Fig. 2). This network also had the highest (148) number of external actors disseminating information on these cookstoves. These cookstoves are slowly becoming popular, and the role of external actors is more important for these cookstoves because they have been in use for over 20 years in the neighboring towns and cities. Information on these cookstoves was also more widely exchanged between villages, with a total of 57 ties between the 8 villages in the micro-watershed (Table 1). From the graph metrics (Table 2), we found that the LPG cookstove network had the highest number of ties and the node with the highest degree centrality. That node can be identified in Fig. 2 as the one with the most number of ties associated with it. The node was listed by most members of the community as a source for information on all three “cleaner” cookstoves. This node represented a member of the local non-profit. The LPG network had the highest average degree centrality, i.e., the average number of ties each node has, making it the most widely discussed cookstove in the study area. The high betweenness of the LPG cookstove network suggested the potential for gate-keeping of information, i.e., there were more nodes between other connected nodes along their shortest distance. The higher number of connected nodes and presence of reiterating, multiple ties between nodes suggested a better chance of information diffusion on LPG cookstoves. The induction cookstove network is a slightly smaller network (Fig. 3). Only a handful of external actors were disseminating information on these cookstoves with a total of only 67 ties. Fewer people also communicated between villages (13 ties). These cookstoves are sold and distributed by door-to-door salesmen, and this gives these cookstoves higher social visibility within the villages. People from the study area found fewer reasons to discuss these cookstoves because of the same social visibility that renders an impression that all have information on these cookstoves. Induction cookstove network had the highest number of connected components and the highest average geodesic distance implying that it takes, on average, longer for nodes in this network to receive information than the other two cookstove networks. Induction cookstove networks were between LPG and Himanshu tandoor network measures for closeness, betweenness, and eigenvector centrality scores. For the Himanshu tandoor network, the most central node was a person associated with the local non-profit. There is some information exchange between people from different villages, but most of them are associated with the local non-profit. The betweenness score was low for Himanshu tandoors as most of the information is held by a few individuals and not propagated further by community members. Himanshu tandoor network had the highest eigenvector centrality score, as evident from the network diagram (Fig. 4). 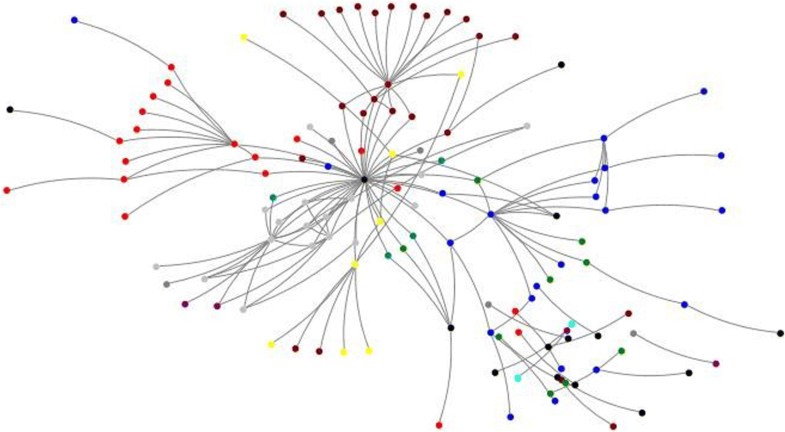 The most central node was connected to another member of the non-profit, who are then connected to others. The network for Himanshu tandoor suggests a strong influence of the local non-profit in information diffusion, but the role is restricted to members of the group only. Of the total 159 ties, 47 ties were to the members of the non-profit alone. Using the KeyPlayer program, we identified key players for each of the cookstove networks. We then identified how many of the key players owned cookstoves for which they were identified as key players. This step is important because people tend to rely on proponents of cookstoves who are also users of the cookstoves, i.e., information from users of the technology holds more ground for the people than through individuals who are only familiar with it . We found that of the 30 key players for each cookstove, only 6 LPG key players owned an LPG cookstove. Himanshu tandoors and induction cookstove had no key players who were also cookstove owners. This could be because key players were identified based on network structures. This measure reflects the strategic positions and does not consider individual attributes such as ownership. We identified 30 key players using the combined information network for all three cookstoves and excluded any individuals that live outside the study area but were listed as information givers and receivers by those we interviewed. These key players occupied strategic positions that allow them to diffuse information on cookstoves the most. This structural position was based on how many people listed them as “information givers” and who these people are connected to. Table 3 provides information on the key players. We had an equal number of men and women who were identified as key players. Out of 30 key players, 22 were associated with a village-level organization, and the same number had household members who pursued occupations other than agriculture. We created cookstove belief models for the 30 key players and 30 randomly selected non-key players . We found a consensus in both groups regarding cookstove factors, but the ratio of eigenvalues for both groups was very different. Non-key players were in much higher agreement with one another (ratio of 31.73) than key players (ratio of 4.1). The key player and non-key players were provided with an exhaustive list of different characteristics of various cookstoves that were identified by members of the community. From this list, we asked informants to identify factors that they agree with and then rank them. We have highlighted cookstove factors that key player and non-key player groups agree upon in Tables 4 and 5, respectively. We found that the key players listed and ranked more factors than the non-key players. The non-key players were aware of a handful of cookstove characteristics that they may have learned through social learning processes. However, not all the information on cookstoves percolates from the key players to non-key players. Cookstove networks show that LPG cookstove had the largest network with highest density, with more ties and connected components among the three cookstoves, which suggests a higher level of social learning regarding this cookstove than others. These results agree with existing literature which suggests that the members of a dense network are exposed to similar kinds of information  and that they display high levels of communication and conformity, both of which aid innovation diffusion . Overall, all three cookstoves displayed low tie density, which implies that people do not communicate about cookstoves much. From participant observation, we learned that information sharing on all cookstoves was a result of people enquiring about new cookstoves. The ones who acquired new cookstoves seldom shared information on their own volition. Most of our informants thought they would be showing off or that everyone knows about new cookstoves and therefore refrained from telling people about new cookstoves. People also rarely discussed cookstoves in a social gathering except for meetings organized for women who were part of a local non-profit. LPG cookstoves are slowly becoming ubiquitous in Lug Valley, Himachal Pradesh. Of the 295 households, 176 households have adopted an LPG cookstove. The nature of the network ties indicates a presence of many external actors. This corresponds with Granovetter  who found that new information usually enters a network from outside of the network through “weak” ties. However, despite this wide presence, significant structural and cultural differences exist in information networks for the cookstoves. We also found that key players, as identified through structural network measures, were seldom owners of cookstoves, which contrasts with Rogers  argument that users of technology are important to its diffusion. This implies that key players, unlike opinion leaders, are not necessarily proponents of cookstoves, but by virtue of their position are able to connect with more individuals. We further postulate that such a network may not promote subjective evaluations but rather word of mouth information. Because subjective evaluations influence diffusion processes, we argue that just having a dense network of information may not be sufficient to promote diffusion, but the nature of the information that circulates in these networks is important as well. Additionally, while key players were able to describe their beliefs about most cookstove factors, non-key players only emphasized a few important attributes. All characteristics listed by the non-key player group were also listed and ranked similarly by the key player group. This implies that the nature of the knowledge shared is not different, but the amount of information that each group holds varies greatly. We also found that the local non-profit was instrumental in disseminating information about “cleaner” cookstoves in the study area. This agrees with Bailis and Hyman  who state that local NGOs and women organizations have a potential to facilitate diffusion of technology such as cookstoves. The difference in belief models points us to opportunities and barriers to the information flow about “cleaner” cookstoves in the study area. Apart from cookstoves, this research contributes more broadly to studies on the diffusion of innovations because of how it combines measures of network structures and cultural beliefs. Network structures alone provide a good picture of how information flows throughout a social setting but does not say anything about the information itself. By measuring cultural beliefs, we were able to understand differences in what individuals throughout the network thought about cookstoves and relate that to their structural position. Aside from addressing concerns of endogeneity in social networks [19, 20], this is important for understanding the diffusion of innovations because diffusion relies on both the mutual influences between people in a social network but also on people’s subjective evaluations of the innovation being diffused . While our previous research advocated for a cultural approach to diffusion that focuses on these subjective evaluations , we show here one way that culture can be integrated with the social structure to give a more complete picture of the diffusion process. However, the picture is not fully complete and there are limitations to our approach. The foremost limitation is that social networks and cultural consensus are not the only way to understand social structures and cultural beliefs, respectively. Future research on the diffusion of innovations would benefit from ethnographic analysis of how cookstoves are situated in particular settings, and how they relate to different social structures such as class, caste, and gender. Second, we only measured the flow of information about cookstoves, not the flow of cookstoves themselves, or how people interact with them daily. Future descriptive research could seek to understand the face-to-face interactions between those promoting cookstoves and those adopting them. This would give a better idea of how diffusion plays out in specific instances, what aspects of cookstoves are emphasized in those conversations, and how that compares to people’s actual use of cookstoves. Despite these limitations, our research has several implications for those hoping to diffuse “cleaner” cookstoves. First, diffusion would likely benefit if the individuals promoting cookstoves had experience using the cookstoves themselves. This has the potential to close the gap in cultural beliefs about cookstoves and better align cookstove diffusion with how people actually perceive and use cookstoves. Second, we recommend further collaboration with local non-profits, which may have more established relationships with the community than people coming in from “the outside” to promote cookstoves . Third, and relatedly, we suggest that diffusion is better seen as an outcome of a relationship than a transaction based on costs and benefits. Taking the time to form relationships between “cleaner” cookstove promoters and potential adopters is likely to help form communities of practice within a social setting and routinize the use of these cookstoves. Doing so will help “cleaner” cookstoves becomes better integrated with people’s daily lives. We found that people are not communicating about the cookstoves much, or their merits and demerits. This lack of communication, coupled with the fact that the key players are usually not cookstove owners, suggests a mismatch between structural and cultural realms. Furthermore, this mismatch suggests that practices surrounding cookstove and energy use are not becoming routinized, and therefore, communities of practice surrounding cookstoves are not being formed. So, the social learning that energy scholars have deemed crucial for changing the social practices of energy use is not occurring. Additionally, this study identifies a lack of overlapping beliefs on merits and demerits of cookstoves as a challenge that needs to be overcome for a more holistic “cleaner” cookstove program. Social network analysis is often critiqued for overemphasizing social structure at the expense of culture and human agency . By identifying key players based on structural properties of the cookstove information networks and correlating their beliefs regarding cookstoves, we take a step toward viewing the social and cultural realms together. The authors are thankful to Mamta Chandar, Director of Jagriti for her constant support. AJ is thankful to Vipin Thakur for helping with translations and accompanying her to all the households. The authors are thankful to the people of Lug Valley for their time, patience, and support. This article was developed under Assistance Agreement No. 83542101 awarded by the U.S. Environmental Protection Agency. It has not been formally reviewed by EPA. The views expressed in this document are solely those of authors and do not necessarily reflect those of the Agency. EPA does not endorse any products or commercial services mentioned in this publication. Data is unavailable at present because anonymity cannot be guaranteed with network data. AJ conceptualized the research, undertook fieldwork, analyzed the data, and wrote the manuscript. PD conceptualized the research, wrote the manuscript, and supervised the research. Both authors have read and approved the final manuscript. The authors obtained oral consent from all informants and in accordance with the University of Georgia Institutional Review Board (#STUDY00001061). The authors declare that they have no competing interests in the successful completion of the research and publication of this manuscript.